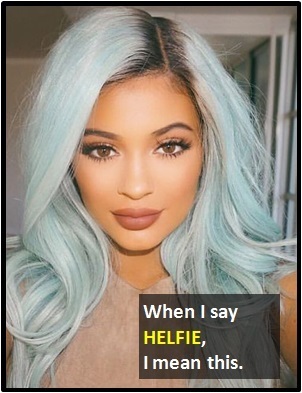 HELFIE | What Does HELFIE Mean? HELFIE means "Hair Selfie". A HELFIE is a photographic self-portrait featuring the hair. HELFIES are usually posted after new hair cuts or hairstyles. HELFIES are often posted on social-media networks (usually Instagram). Many popular celebrities post HELFIES to show off their new hairstyles. HELFIE is a portmanteau word formed from "hair" and "selfie". Person A: I can't seem to take a good HELFIE. Person B: Go somewhere with good lighting. You need to show off your new hairstyle. The term HELFIE is an amalgam of the words "hair" and "selfie."